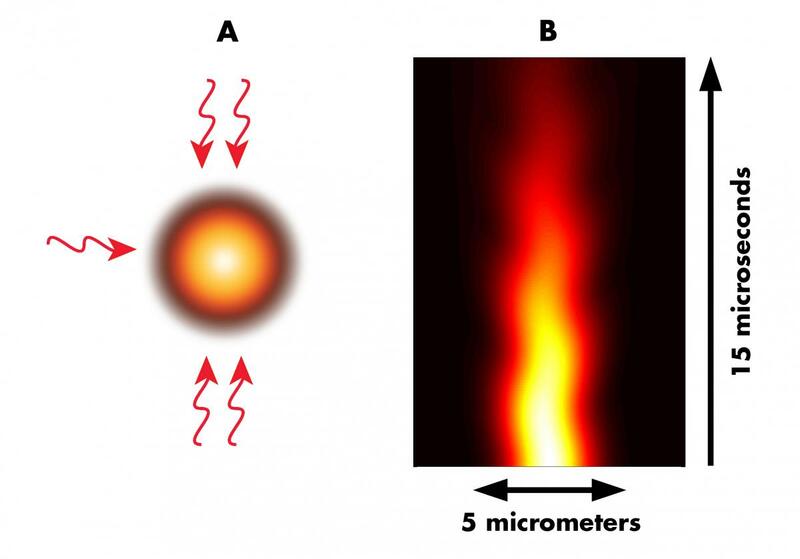 A) Optical lattice of five laser beams trapping an atomic cloud. Color scale indicates cloud density: black is low, white high. B) Jittering motion of the atomic cloud in the optical lattice. The horizontal axis represents the spatial distribution of the cloud along one direction, while the vertical axis shows the variation of cloud density with time. Ultracold atoms moving through a carefully designed arrangement of laser beams will jiggle slightly as they go, two NIST scientists have predicted. * If observed, this never-before-seen “jitterbug” motion would shed light on a little-known oddity of quantum mechanics arising from Paul Dirac’s 80-year-old theory of the electron. Dirac’s theory, which successfully married the principles of Einstein’s relativity to the quantum property of electrons known as spin, famously predicted that the electron must have an antiparticle, subsequently discovered and named the positron. More enigmatically, the Dirac theory indicates that an isolated electron moving through empty space will vibrate back and forth. But this shaking—named Zitterbewegung from the German for ‘trembling motion’—is so rapid and so tiny in amplitude that it has never been directly observed. Jay Vaishnav and Charles Clark of the Joint Quantum Institute, a partnership of NIST and the University of Maryland, have devised an experimental arrangement in which atoms are made to precisely mimic the behavior of electrons in Dirac’s theory. The atoms will show Zitterbewegung—but with vibrations that are slow enough and large enough to be detected. Vaishnav and Clark’s proposal begins with an atom—rubidium-87 is an example—that has a ‘tripod’ arrangement of electron energy levels, consisting of one higher energy level above three equal-energy lower levels. Suppose, say the researchers, that such atoms are placed in a region crisscrossed by lasers at specific frequencies. Two pairs of laser beams face each other, creating a pattern of standing waves, while a third laser beam is set perpendicular to the other two. Given the proper frequencies of light, a perfectly stationary “tripod” atom at the intersection will have the energy of its upper state and one of the three lower states slightly changed. To a moving atom, however, the electromagnetic field will look a little different, and in that case the energies of the other two lower states also change slightly. Remarkably, those two states, moving in this particular arrangement of laser light, are governed by an equation that’s exactly analogous to the Dirac equation for the two spin states of an electron moving in empty space. In particular, as the atom moves, it flips back and forth between the two states, and that flipping is accompanied by a jiggling back and forth of the atom’s position—a version of Zitterbewegung with a frequency measured in megahertz, a hundred trillion times slower than the vibration of a free electron. Other arrangements of lasers and atoms have been used to cleanly simulate a variety of quantum systems, says Vaishnav. Examples includes recent studies of the mechanisms of quantum magnetism and high-temperature superconductivity. ** What’s unusual about this new proposal, she adds, is that it offers a simulation of a fundamental elementary particle in free space and may offer access to an aspect of electron behavior that would otherwise remain beyond observational scrutiny. * J.Y. Vaishnav and C.W. Clark. Observation of zitterbewegung in ultracold atoms. Presented at the March Meeting of the American Physical Society, March 10, 2008, New Orleans, La., Session A14.00003. ** I. Bloch. Towards quantum magnetism with ultracold quantum gases in optical lattices. Presented at the March Meeting of the American Physical Society, March 12, 2008, New Orleans, La., Session P7.00003. and A.M. Rey. Probing and controlling quantum magnetism with ultra-cold atoms. Presented at the March Meeting of the American Physical Society, March 12, 2008, New Orleans, La., Session P7.00004.